The 2016 Honolulu mayoral election determined the Mayor of the City and County of Honolulu for the full term commencing in January 2017. As in the previous several elections, the Honolulu metro and its cost overruns was a major topic of the campaign. ^ "Caldwell fails to clinch majority, will face off against Djou in November". Hawaii News Now. August 13, 2016. Retrieved August 14, 2016. ^ Pang, Gordon Y.K. (August 13, 2016). "Caldwell, Djou head to runoff election in November". Honolulu Star-Advertiser. Retrieved August 14, 2016. ^ a b Honolulu, Hawaii Mayor: Results: Kirk Caldwell Leads, New York Times, November 10, 2016. Retrieved 11 November 2016. ^ HNN Staff (June 7, 2016). "Charles Djou announces he's running for mayor". Hawaii News Now. Retrieved June 11, 2016. ^ Morales, Manolo; web staff (May 13, 2016). "Peter Carlisle announces candidacy for Honolulu mayor". KHON-TV. Retrieved June 14, 2016. ^ "PRIMARY ELECTION 2016 – State of Hawaii – Statewide" (PDF). State of Hawaii Office of Elections. August 16, 2016. p. 1. Retrieved August 20, 2016. ^ Pang, Gordon Y.K. (May 13, 2016). "Caldwell collects first major endorsement of mayoral race". Honolulu Star-Advertiser. Retrieved July 4, 2016. ^ "HGEA Announces Primary Election Endorsements" (Press release). Hawaii Free Press. June 20, 2016. Retrieved July 4, 2016. ^ a b c d Blair, Chad (June 15, 2016). "Djou Gets Some Democratic Support In Campaign For Mayor". Politics. Civil Beat. Retrieved June 26, 2016. A desire to kick Kirk Caldwell out of office brought three top Hawaii Democrats together Wednesday at a press conference to voice their support for Charles Djou for mayor. ^ "SHOPO endorses Caldwell for Honolulu Mayor". KITV. June 24, 2016. Retrieved July 4, 2016. ^ Blair, Chad (June 9, 2016). "Aiona Endorses Djou for Mayor". Politics. Civil Beat. Retrieved June 26, 2016. ^ a b c d e Devera, Jobeth (June 27, 2016). "Major Unions Endorse Djou for Mayor". Hawaii News Now. Retrieved July 4, 2016. This is the first time Djou has received the backing of any organized labor since 2006. ^ Lee, Grace. "Mayoral and rail poll explained". Hawaii News Now. Retrieved August 18, 2016. 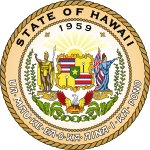 ^ "PRIMARY ELECTION 2016 – State of Hawaii – City and County of Honolulu" (PDF). State Of Hawaii Office of Elections. August 14, 2016. p. 3. Retrieved August 20, 2016. ^ Mayor Kirk Caldwell Re-Elected Over Charles Djou, Honolulu Civil Beat, Chad Blair, November 8, 2016. Retrieved 11 November 2016.